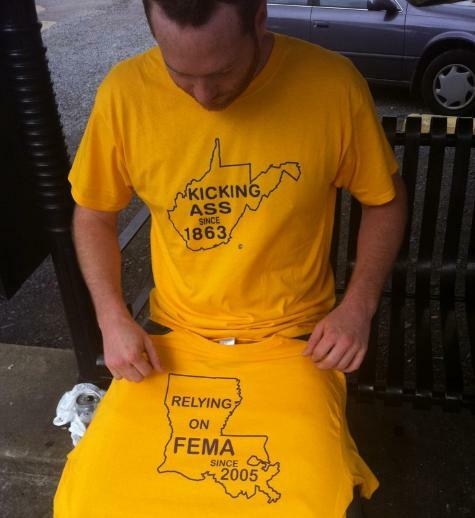 West Virginia fans have no class. According to the Charleston Daily Mail, after LSU stomped an overrated and outclassed West Virginia team 47-21, Mountaineer fans decided to take out their frustration on random LSU fans. A 22-week pregnant female was driving her vehicle out of the purple lot in bumper-to-bumper traffic right outside Milan Puskar Stadium when an unknown individual threw a rock into her car, which landed on her lap. Her husband, Marcus Mason, who was sitting in the front passenger seat was irate and asked nearby individuals who threw the rock. The individuals did not respond but rather aggressively approached the vehicle to pick a fight. They first tried to pull the back seat passengers out of the car, but were unsuccessful. Next they went to the front door and pulled Marcus out of the vehicle and proceeded to beat him senseless. His wife, Hannah, immediately rushed out of the vehicle and tried to stop the attackers. During the melee, someone knocked her down. Only after Hannah frantically started screaming that she was pregnant did the attackers finally stop. Of course, no one around attempted to stop the fight. The West Virginia fans just stood by and watched. As a result of the attack, Marcus suffered a broken nose, crushed eye socket and a fractured frontal bone. Fortunately, he did not suffer any serious brain injury and the frontal bone fracture should heal on its own. The eye-socket can be replaced with a plastic plate. Hannah’s injuries were minor. She only suffered visible bruising on her arms, legs and shoulders. The unborn child is said to be unhurt. The other two individuals in the vehicle who tried to stop the attackers also suffered minor injuries. At this point, no suspects have been identified. Morgantown police are asking for any witnesses to come forward and to contact the police at 304-284-7454.